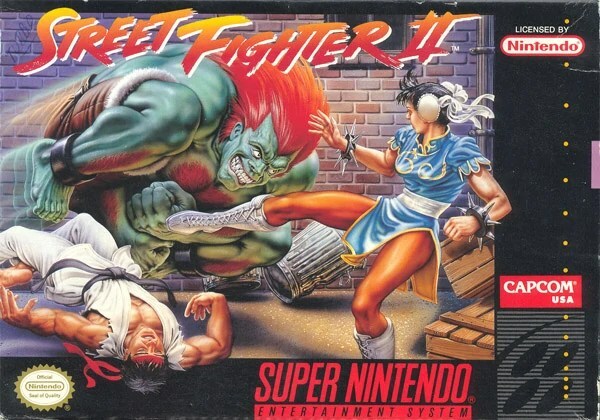 While I’ve written quite a bit about video games from my youth, I haven’t said all that much about one of the biggest hits of the early nineties, Street Fighter II: The World Warrior. A one-on-one fighting game that inspired a crapload of imitators, its plot revolves around a street fighting tournament held in various locations around the world. I’m not sure why they couldn’t find a central location for this, because the air fare must have been ridiculous. Also, is it really street fighting if it’s in an organized competition? The rules apparently specify that weapons are out, but magic powers are just fine. The Mortal Kombat series would greatly expand upon the idea of supernatural aspects in a brawling game, but I never got into those. Anyway, the game was a hit in arcades before being ported to the Super Nintendo, and was later remade several times. 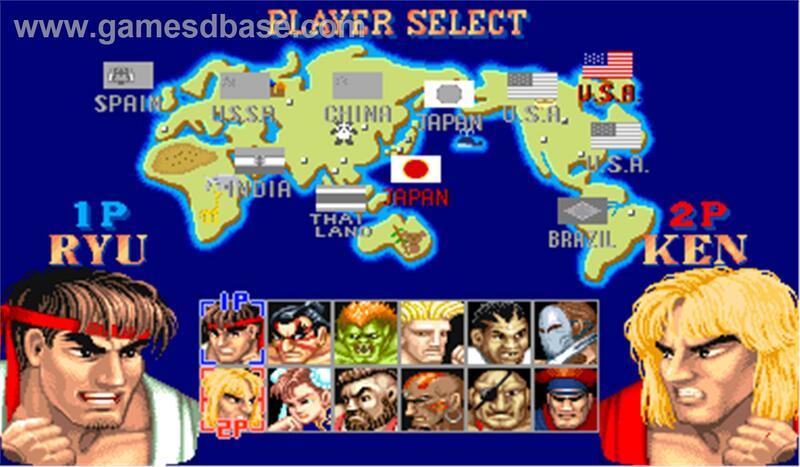 There was eventually a Street Fighter III, but not until after new versions of SF2 with cool-sounding words like “Alpha” and “Turbo” in their names. The most memorable thing about this game was probably its characters, each of whom had their own special abilities and back story. Ryu and Ken Masters – Okay, these two actually don’t fit that rule, since they had exactly the same abilities and quite similar back stories. They were the playable characters in the original Street Fighter, experts in martial arts who were trained by the same master. 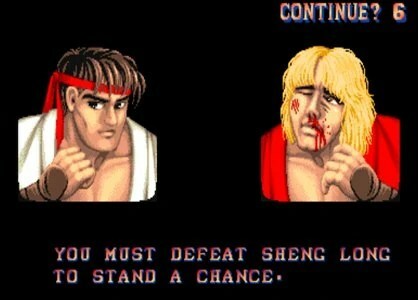 This master was eventually named Gouken and appeared in a later Street Fighter game, but some English media originally referred to him as Sheng Long due to a mistranslation. One of their moves is the Hadouken, in which the user fires spiritual energy from his palms at an opponent. The name literally means “wave motion fist,” and was created for the games but later made its way into other media. In the comic 8-Bit Theater, it’s Black Mage’s most powerful spell, even though it doesn’t appear in any of the Final Fantasy games. It is, however, a move in Mega Man X. Drew Mackie recently wrote about a kid in 1993 mispronouncing it as “all you can.” There’s also the Shoryuken, or Rising Dragon Punch, which oddly contains the names of both of the characters who use it. 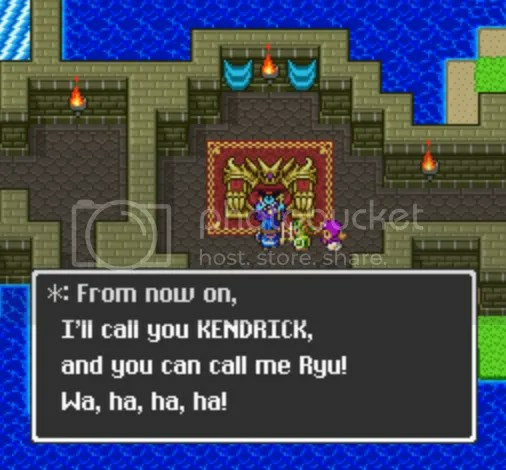 “Ryu” means “dragon,” and is a name used for quite a few video game characters, including the hero of Ninja Gaiden and the Breath of Fire games, as well as the Dragonlord’s grandson in Dragon Quest II. I gather than “Ken” can mean “fist” or “punch,” although since he’s American his parents probably didn’t realize this when they named him. I guess it’s one of those names that becomes relevant later in life, like Edward Nigma or Remus Lupin. 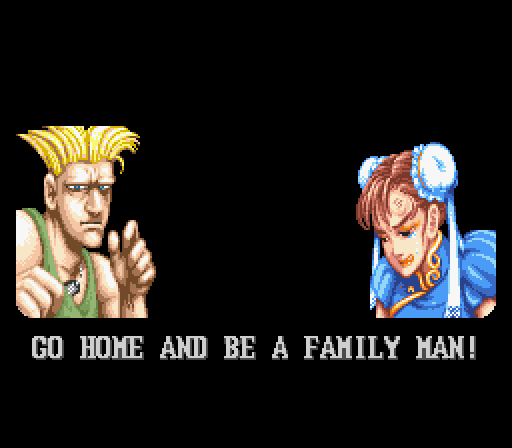 In Ken’s ending to SF2, he’s shown marrying his girlfriend. Her name is Eliza, but I like to think of this Ken being the same one who dates Barbie. 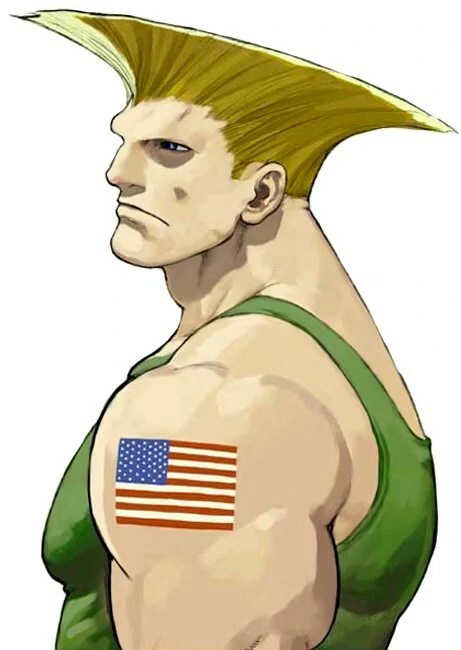 Guile – A major in the United States Air Force who apparently chose to mimic Bart Simpson’s hairstyle, his motivation is that his old comrade Charlie was killed by M. Bison. In the live-action movie (which I haven’t seen), his first name is William, but I don’t think this was ever stated in the actual games. As of the end of SF2, he’s Ken’s brother-in-law, being married to Eliza’s sister Julia. He has the power to generate sonic booms, because I guess hanging around planes long enough gives you some of their abilities. Blanka – Speaking of gaining supernatural powers in unrealistic ways (okay, I’m not sure there’s a REALISTIC way to gain supernatural powers, but some stretch believability more than others), this guy’s ability to electrocute his opponents apparently comes from electric eels. He’s basically the archetypal feral child, having been raised by animals in the rain forest of Brazil after being separated from his parents in a plane crash. And he’s apparently green because he ingests a lot of chlorophyll. His Wikipedia page points out that his head-biting move is similar to that of the Amazon from Pro Wrestling, who is also green and possibly from Brazil. If you win the game as Blanka, he is reunited with his mother and learns that his given name is Jimmy. E. Honda – His full first name is Edmond, which doesn’t really look Japanese. Maybe he was named when someone was looking up a Honda car on Edmunds. 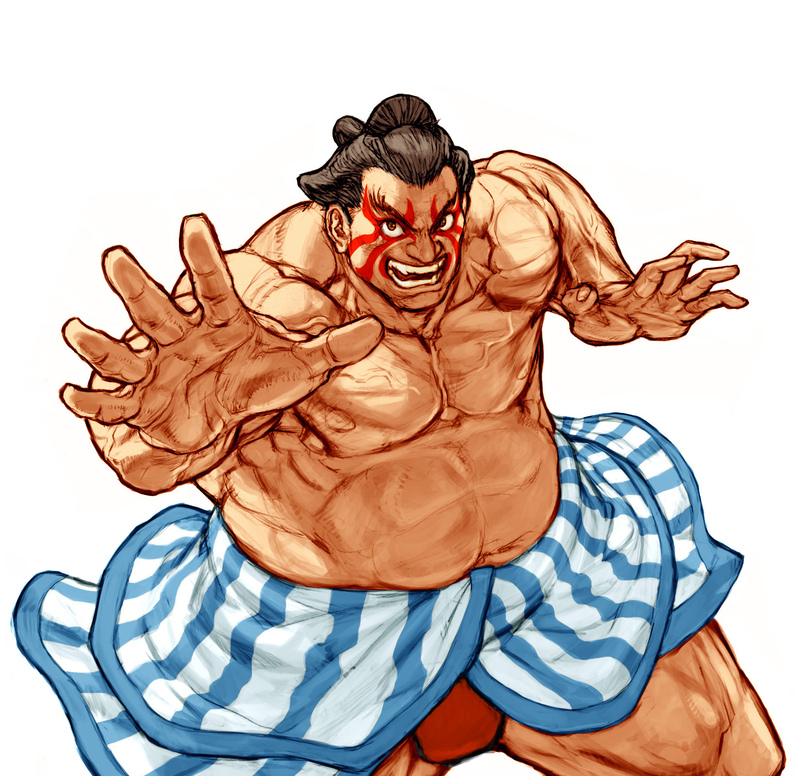 Seriously, he’s a sumo wrestler, and that’s pretty much all you have to know about him. His signature move is the Hundred Hand Slap, which I guess is supposed to have the same power as being hit with one hundred hands at once. The Japanese love to give special attacks names like this, the one that immediately comes to mind being the Thousand Needles spell used by Cactaurs in the Final Fantasy series. 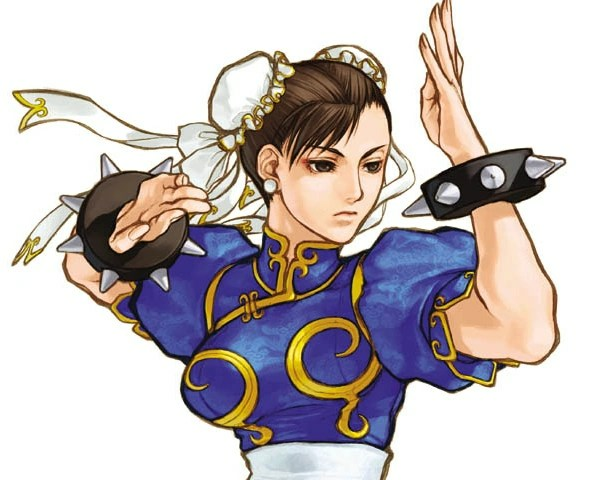 Chun-Li – The only female fighter in this game (there would be more introduced later in the series), which makes her a very popular choice for cosplay. She’s from China, although her skin tone looks pretty Caucasian to me. Her name is apparently Mandarin Chinese for “beautiful spring,” and her double-bun hairstyle is known as ox horns. She works as an Interpol agent, trying to bring M. Bison to justice because he was responsible for her father’s death. It also sounded to me like she said “that’s that” after winning a fight, but I don’t think she actually does, as appropriate as that would be. She does say “spinning bird kick” in English. Dhalsim – A skinny guy from India who is able to use yoga to levitate, stretch out his limbs, breathe fire, and even dematerialize in later versions of the game. According to his back story, he’s actually a pacifist, but joins the tournament anyway in order to raise money for his village. He’s married to a woman named Sari (wouldn’t that be like an American woman being named Shirt? ), and they have a son called Datta. And he has an elephant, which makes him much cooler in my book. I remember looking at some gaming magazine where they offered a prize to anyone who could find a real person named Dhalsim. I don’t know if anyone ever did. His name actually comes from an Indian restaurant in Osaka, so I doubt it. 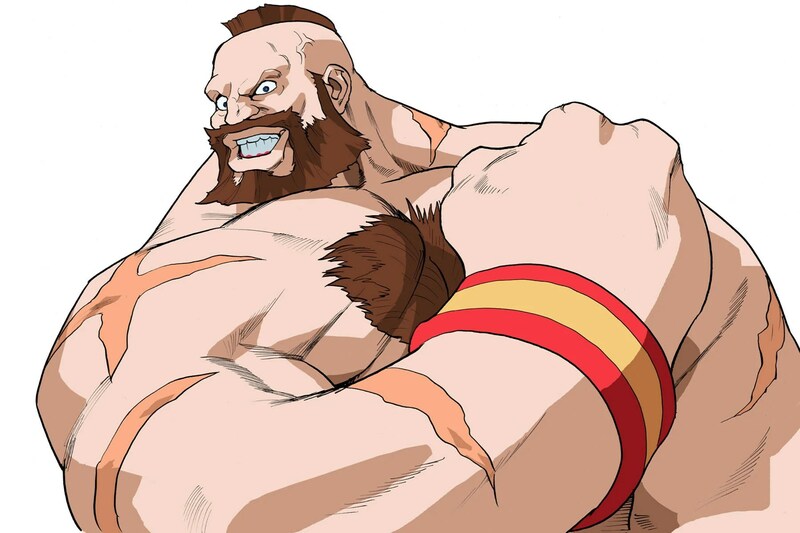 Zangief – Named after real-life Russian wrestler Victor Zangiev, he’s a hulk of a man known for his spinning clothesline move, and has scars from wrestling bears. 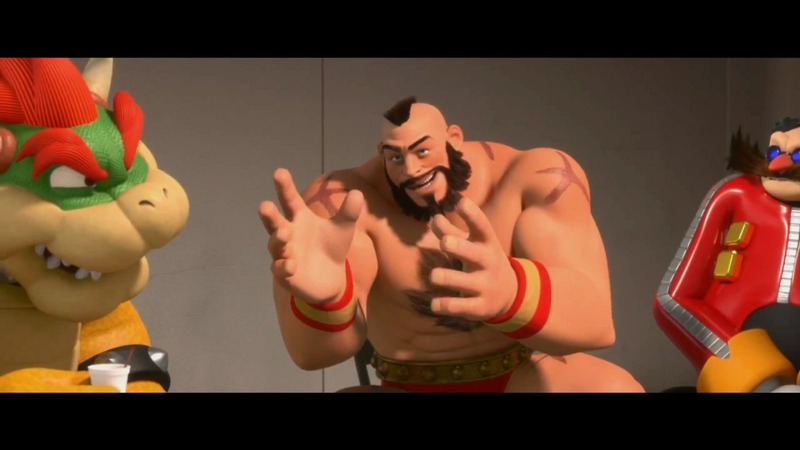 While several SF characters appeared in Wreck-It Ralph, he had the biggest role, being voiced with a comical Russian accent by director Rich Moore. His Wikipedia page refers to him as the most successful Russian video game character, although I’d be loath to tell this to Karnov. It also mentions that his original name was Vodka Gobalsky, bringing to mind Punch-Out!‘s Vodka Drunkenski, or Soda Popinski in the American version. Balrog – The first of the four boss characters who aren’t playable in the original game but are in later versions, he’s a boxer who doesn’t use leg-based attacks at all. So why is a boxer named after a demonic creature from Lord of the Rings? Actually, in the Japanese version, he wasn’t. He was named Mike Bison, as he was a play on Mike Tyson. The American translators feared a lawsuit from the actual Tyson, so they ended up switching the characters’ names around. 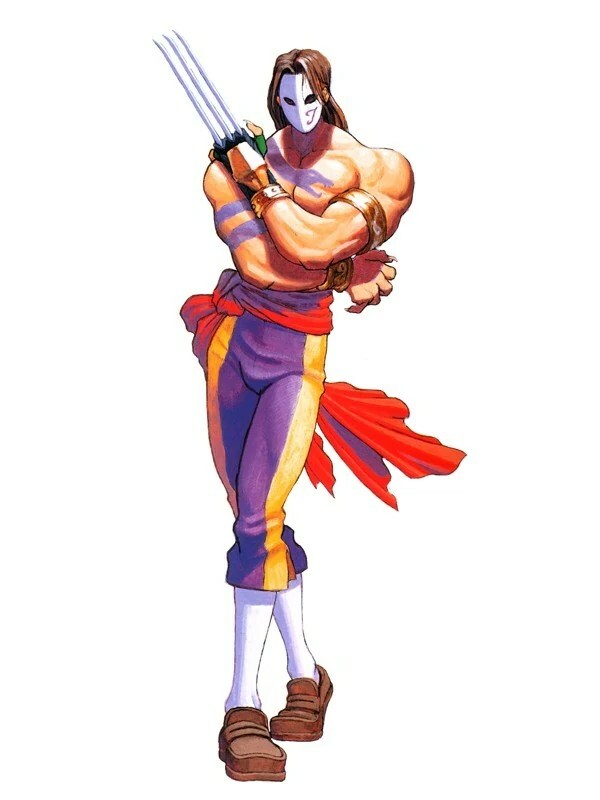 Vega – In the Japanese version, this guy was Balrog, and the name of the being that killed Gandalf really didn’t suit him either. At least “Vega” sounds kinda-sorta Spanish, which this character is supposed to be. His outfit is basically what you’d get if you combined a matador with Shredder from Teenage Mutant Ninja Turtles. Why he’s allowed to use the claws when no one else has a weapon, I couldn’t say. He’s a narcissist and a serial killer, having started murdering people when his stepfather killed his mother, and focusing on killing those he deems to be ugly. Sagat – With a name like this, you’d think he’d be better suited for Full House Tournament Fighter. Seriously, though, his name might be a reference to Muay Thai fighter Sagat Petchyindee, although this has never been officially confirmed. He joins Ken and Ryu in being a carryover from the original SF, in which he’s the final boss, and the scar across his chest is explained as having resulted from his fight with Ryu. Sagat is incredibly tall and muscular, bald-headed, and blind in one eye. His most famous move is the Tiger Uppercut, and the background for his stage is the lying Buddha statue in the ruins of Ayutthaya. 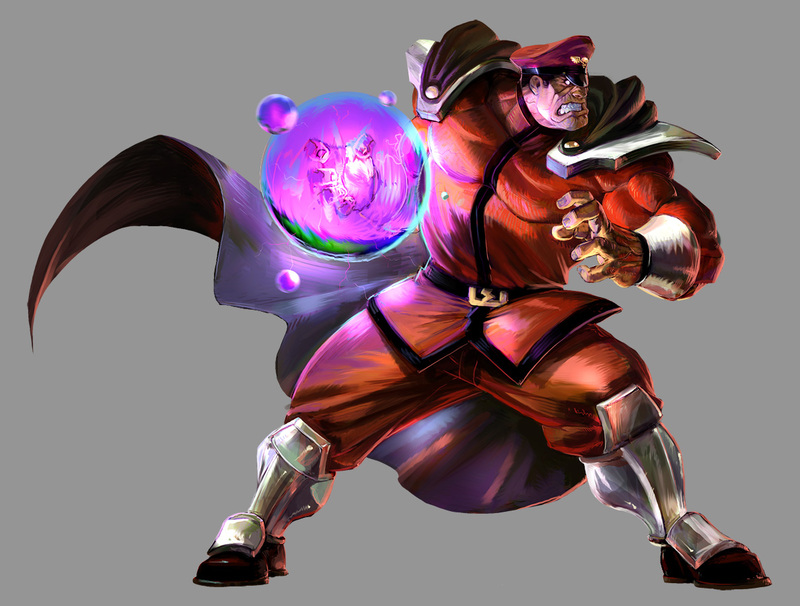 M. Bison – The final boss is the evil leader of a worldwide criminal organization called Shabadoo…no, sorry, “Shadaloo.” Apparently the name wasn’t a high priority for him. He dresses as a dictator and seeks to rule the world, presumably considering running street fighting tournaments to be an integral part of his plan of conquest. One thing you can say for him is that he’s actually willing to fight in person, a touch you don’t typically get with leaders of evil organizations. Well, okay, I guess you do in video games. In Japan he was called Vega after the star, but the American translators thought that sounded kind of wimpy for the main villain. Actually, I looked up the origin of the name Vega, and Wikipedia says it comes from the Arabic for “falling eagle.” That sounds like an empire that’s on its way out rather than a new one being established, making it kind of ironic. It also makes me think of the villain Capricorn from Inkheart, who also had a star-related name. And that’s it, at least in terms of the game as I remember it. Now go home and be a family man! This entry was posted in Authors, Breath of Fire, Comics, Dragon Quest, Final Fantasy, J.R.R. Tolkien, Mega Man, Punch-Out, Street Fighter, Teenage Mutant Ninja Turtles, Video Games and tagged 8-bit theater, balrog, black mage, blanka, cactaurs, chun-li, dhalsim, edmond honda, gouken, guile, hadoken, hadouken, inkheart, ken masters, lord of the rings, m. bison, mega man x, mike tyson, mortal kombat, ninja gaiden, pro wrestling, rich moore, ryu, sagat, shadaloo, sheng long, shoryuken, shredder, street fighter ii, the amazon, vega, wreck-it ralph, zangief. Bookmark the permalink.